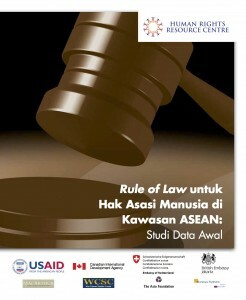 Five years after HRRC’s inaugural Rule of Law for Human Rights in the ASEAN Region: A Baseline Study, the Centre will be presenting an update of the baseline at a launch in Jakarta, Indonesia, in the afternoon of 10 June. The forthcoming study, Update on the Rule of Law for Human Rights in ASEAN: The Path to Integration, analyses the policy and legislative changes that have taken place in the ten ASEAN member states since 2011. It also considers whether these changes support or detract from ASEAN’s vision of becoming a “rules-based” community. Bearing in mind the significant milestone that ASEAN reached at the end of 2015 with the formal launch of the ASEAN Community, the time is ripe to conduct a second inventory of the state of the rule of law in ASEAN. (ii) Principle II: Whether laws and procedures for arrest, detention and punishment are publicly available, lawful and not arbitrary. (iii) Principle III: Whether persons have access to justice as the process by which laws are enacted and enforced is accessible, fair, efficient, and equally applied. (iv) Principle IV: Whether justice is administered by a competent, impartial, and independent judiciary and justice institutions. The update will thereafter consider what progress has been made toward establishing a rules-based community of shared values and norms and whether the process of ASEAN integration has accelerated activity toward the creation of stronger legal institutions within ASEAN Member States. The research team is headed by Francis Tom Temprosa of the Philippines, who will be presenting key findings during the launch. All are invited to come. For more information, please contact Ms. Paula Luciana (E: p.luciana@hrrca.org; M: +62 811 1388 899). ASEAN, Events, Indonesia, Rule of Law. permalink.